This is very simple cake recipe with very less ingredients and time also. This is made up with sweet bun and other ingredients which are normally are in your fridge. I like sweet buns, they are in my fridge every time, I love to eat sweet bun with Tea. 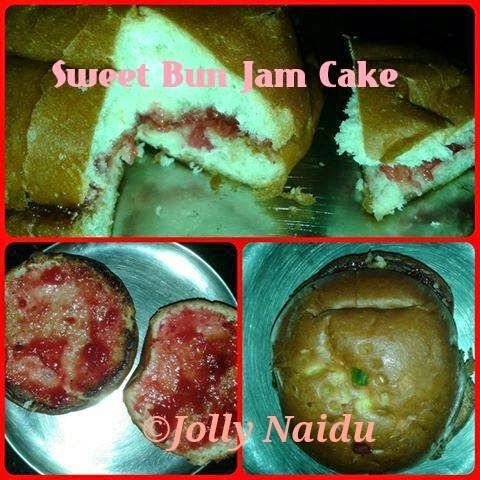 But today, I feel something to do creativity with buns, so I made this cake and I named it as Sweet Bun Jam Cake. It is a tasty as well as nutritious snack for kids. This cake is very attractive also. Their taste is also different like other cakes. First, I made this cake for my husband on Valentine's day and he liked it very much, he doesn't like sweet buns but he like this fusion cake very much. He demanded me to please can you make this cake for me every week. So, finally my husband started eating buns not simple one but this kind of fusion recipe. You can do lots of creativity with sweet buns. 1.For preparing this sweet bun snacks, split the bun and spread the butter on one side of both the pieces and then spread the jam on toasted side. 2. Now sprinkle the chopped almonds, pistachio and cashew nuts. 3. Repeat the procedure with the other bun too. Refrigerate it to cool. 4. Simple Sweet Bun Snacks is ready. Cut it into pieces before serving. Tips : You can make Whipped cream icing to decorate this sweet bun cake. You do lots of creativity with this snack.